(CBS/AP) NEW YORK - A blind Chinese legal activist who was suddenly allowed to leave the country arrived in the U.S. on Saturday, ending a nearly monthlong diplomatic tussle that had tested U.S.-China relations. Chen Guangcheng had been hurriedly taken from a hospital hours earlier and put on a plane for the United States after Chinese authorities suddenly told him to pack and prepare to leave. He arrived Saturday evening at Newark Liberty International Airport and was whisked to New York City, where he will be staying. 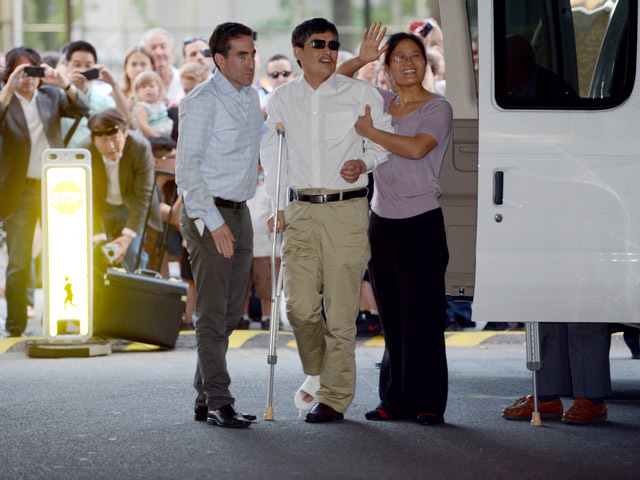 Dressed in a white shirt and khaki pants and using crutches, his right leg in a cast, Chen was greeted with cheers when he arrived at the apartment in Manhattan's Greenwich Village where he will live with his family. The complex houses faculty and graduate students of New York University, where Chen is expected to attend law school. "For the past seven years, I have never had a day's rest," he said through a translator. "So I have come here for reparation in body and spirit." Chen urged the crowd to fight for injustice, and thanked the U.S. and Chinese governments, and also the embassies of Switzerland, Canada and France. The departure of Chen, his wife and two children to the United States marked the conclusion of nearly a month of uncertainty and years of mistreatment by local authorities for the self-taught activist. After seven years of prison and house arrest, Chen made a daring escape from his rural village in April and was given sanctuary inside the U.S. Embassy, triggering a diplomatic standoff over his fate. With Secretary of State Hillary Rodham Clinton in Beijing for annual high-level discussions, officials struck a deal that let Chen walk free, only to see him have second thoughts. That forced new negotiations that led to an agreement to send him to the U.S. to study law, a goal of his, at New York University. Chen's expected attendance at New York University comes from his association with Jerome Cohen, a law professor there who advised Chen while he was in the U.S. Embassy. The two met when Chen came to the United States on a State Department program in 2003, and Cohen has been staunch advocate for him since. "I'm very happy at the news that he's on his way and I look forward to welcoming him and his family tonight and to working with him on his course of study," Cohen said. Chen and his family will live in an apartment at the Washington Square Village complex, a New York University housing facility where faculty and graduate students reside, an NYU spokesman said. Earlier, Chen and his family left China a few hours after they were notified they would be allowed to leave. According to Sky News correspondent Holly Williams, who spoke with Chen as he was awaiting to board his flight, they were informed by the staff at the Beijing hospital where he had been getting treatment for the last couple of weeks. When Chen and his family arrived at Beijing's airport, they were given their long-awaited passports by U.S. diplomats. The four departed on United Airlines Flight 88, which took off late Saturday afternoon from Beijing. He said he is not seeking political asylum. He does not plan to stay in the U.S. in the long term and hopes that one day he will be allowed to return to China. To his supporters and others in the activist community, Chen expressed gratitude and indicated that he hoped to return. "I am requesting a leave of absence, and I hope that they will understand," he said. Chen and his family were driven up to the plane in a vehicle resembling a minibus, and Chen could be seen being pushed in a wheelchair on the tarmac and then onto an elevator that took them up to a sky bridge that was connected to the plane. Chen and his family's departure to the United States marks the conclusion of nearly a month of uncertainty and years of mistreatment by local authorities for the self-taught legal activist who made a daring escape from abusive house arrest in his village last month. His supporters welcomed his departure. "I think this is great progress. We are happy about it," said U.S.-based rights activist Bob Fu. "It's a victory for freedom fighters." Chen sought the protection of U.S. diplomats at the American Embassy in Beijing, triggering a diplomatic standoff days ahead of unrelated high-level talks on global hotspots and economic imbalances led by Secretary of State Hillary Rodham Clinton. After days of negotiations, the sides announced an agreement in which he and his family would be allowed to travel to the United States for him to study. Chen said he was informed at the hospital just before noon Saturday to pack his bags and get ready to leave. Officials did not give him and his family passports or inform them of their flight details until after they got to the airport. Seeming ambivalent, Chen said that he was "not happy" about leaving and that he had a lot on his mind, including worries about retaliation against his extended family back home. "I hope that the government will fulfill the promises it made to me, all of its promises," Chen said. Such promises included launching an investigation into abuses against him and his family in Shandong province, he said before the phone call was cut off. Chen and other activists fear authorities in Shandong province will punish Chen's extended family for his audacious escape. Chen's nephew, Chen Kegui, is accused of attempted murder after he allegedly used a kitchen knife to attack officials who stormed his house after discovering Chen Guangcheng was missing. Chen Guangcheng had been awaiting permission to travel to the U.S. to take up an invitation to study law at New York University after he left the embassy on May 2 and was hospitalized for treatment of injuries sustained during his escape. The State Department has said that U.S. visas for Chen, his wife and children were ready for them to travel to America. The Chinese Foreign Ministry said Saturday that it had no comment on Chen's planned departure. The 40-year-old Chen is emblematic of a new breed of activists that the Communist Party finds threatening. Often from rural and working-class families, these "rights defenders," as they are called, are unlike the students and intellectuals from the elite academies and major cities who led the Tiananmen Square democracy movement. A self-taught legal activist, Chen gained recognition for crusading for the disabled and fighting against forced abortions in his rural community. But he angered local officials and was convicted in 2006 on what his supporters say were fabricated charges. After serving four years in prison, he then faced an abusive and illegal house arrest. Nanjing activist blogger He Peirong, who was instrumental in helping Chen escape from house arrest, said she was "very happy" to hear that Chen and his family were on their way to the United States. "I hope that this will be a good beginning," said He, who was detained for several days by police for helping Chen. "I hope that they will all be well and safe."